From all of the members of the ACA, we would like to say congratulations to all the AMMO Schoolhouse’s ACA recipients. Great Job! IYA AMMO YAS! Top Grad: A1C McDuffie, Chiante K.
Top Grad: A1C Chen, Yolanda Y.Y. Top Grad: A1C Diamond, Richard K.
Top Grad: SrA Takacs, David M.
The AMMO Schoolhouse Top Graduate Award was presented to Airman Rehnert for Outstanding achievement in the Munitions Apprentice Course, Sheppard AFB, Texas, 29 Jul 14. On behalf of the ACA, the Munitions Training Flight Chief, further recognized Amn Rehnert’s superior accomplishments with the presentation of the AMMO Chiefs Top Graduate Award along with the ACA Spirit Award coin. Class 140032, Amn Rehnert graduated 29 Jul 14 and is headed to Hurlburt Field AFB, FL. 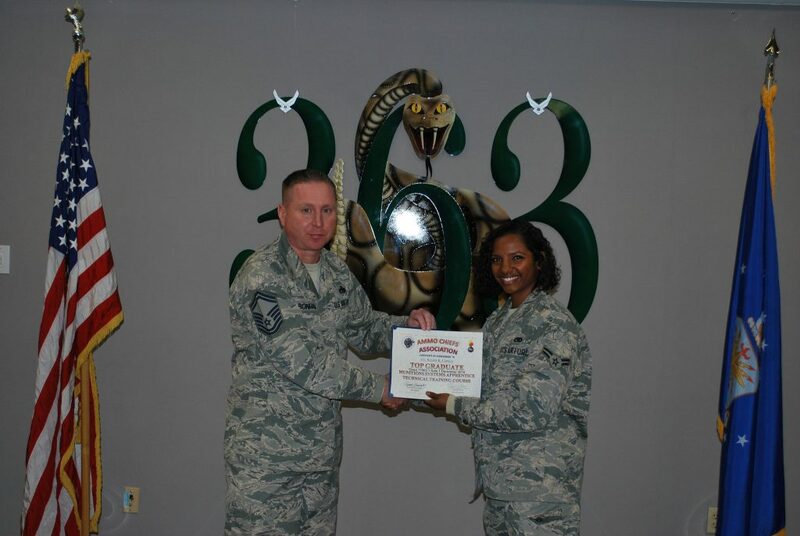 The AMMO Schoolhouse Top Graduate Award was presented to Airman First Class Petges for Outstanding achievement in the Munitions Apprentice Course, Sheppard AFB, Texas, 22 Jul 14. On behalf of the ACA, the Munitions Training Flight Chief, further recognized A1C Petges’ superior accomplishments with the presentation of the AMMO Chiefs Top Graduate Award along with the ACA Spirit Award coin. 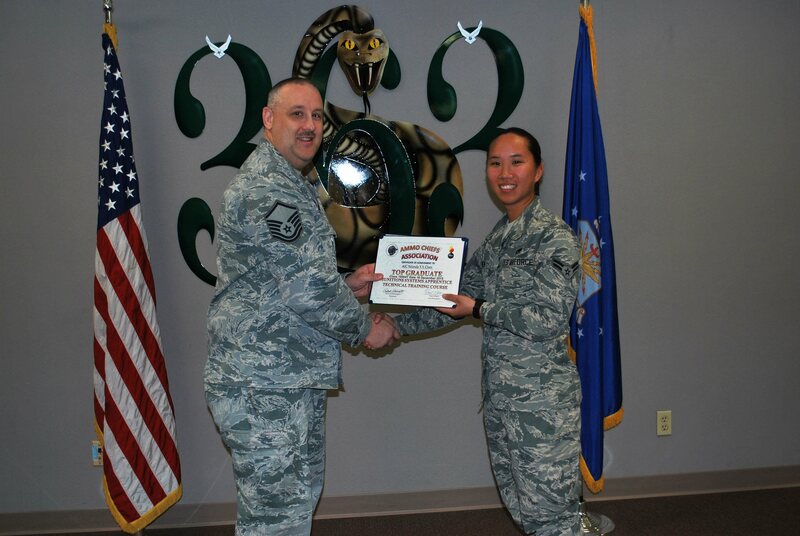 Class 14031T, A1C Petges graduated 22 Jul 14 and is headed to Tulsa OK ANG. 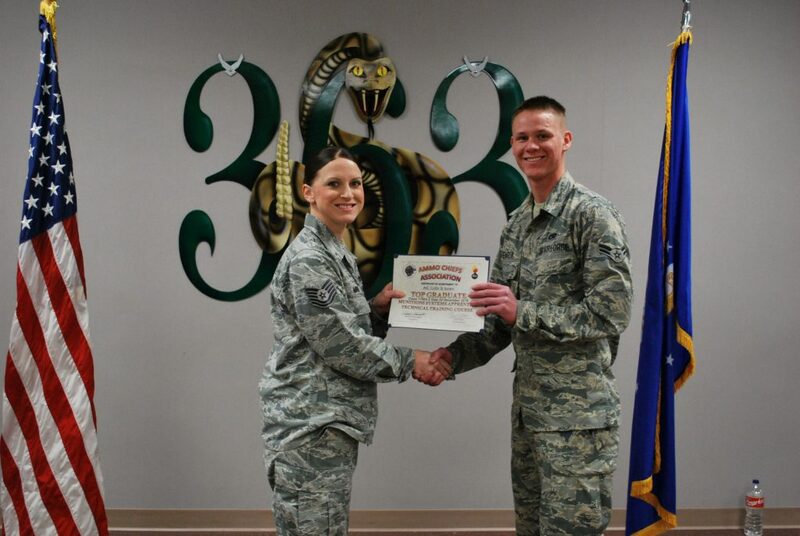 In addition to the Top Grad honor, A1C Petges was an AMMO ACE Award Winner. He scored 100 % on all course exams! 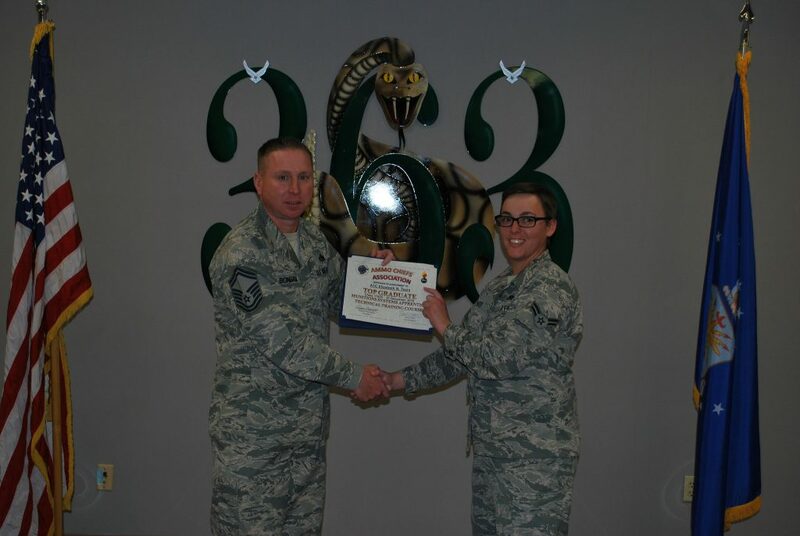 The AMMO Schoolhouse Top Graduate Award was presented to Airman First Class Callaghan for Outstanding achievement in the Munitions Apprentice Course, Sheppard AFB, Texas, 22 Jul 14. On behalf of the ACA, the Munitions Training Flight Chief, further recognized A1C Callaghan’s superior accomplishments with the presentation of the AMMO Chiefs Top Graduate Award along with the ACA Spirit Award coin. Class 140031S, A1C Callaghan graduated 22 Jul 14 and is headed to Syracuse NY ANG. Due to unforeseen circumstances A1C Callaghan was unavailable for photo. 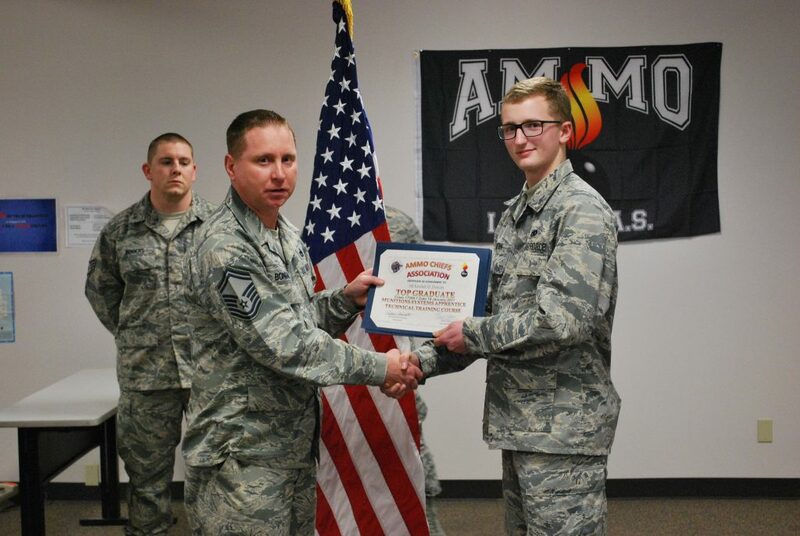 The AMMO Schoolhouse Top Graduate Award was presented to Airman First Class Van Wieren for Outstanding achievement in the Munitions Apprentice Course, Sheppard AFB, Texas, 16 Jul 14. On behalf of the ACA, the Munitions Training Flight Chief, further recognized A1C Van Wieren’s superior accomplishments with the presentation of the AMMO Chiefs Top Graduate Award along with the ACA Spirit Award coin. 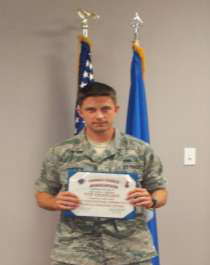 Class 14030T, A1C Van Wieren, graduated 16 Jul 14 and is headed to Moody AFB, GA. Photo is unavailable. The AMMO Schoolhouse Top Graduate Award was presented to Airman First Class Cavagnaron for Outstanding achievement in the Munitions Apprentice Course, Sheppard AFB, Texas, 1 Jul 14. On behalf of the ACA, the Munitions Training Flight Chief, further recognized A1C Cavagnaro’s superior accomplishments with the presentation of the AMMO Chiefs Top Graduate Award along with the ACA Spirit Award coin. The AMMO Schoolhouse Top Graduate Award was presented to Airman First Class Lanza for Outstanding achievement in the Munitions Apprentice Course, Sheppard AFB, Texas, 17 June 14. On behalf of the ACA, the Munitions Training Flight Chief, further recognized A1C Lanza’s superior accomplishments with the presentation of the AMMO Chiefs Top Graduate Award along with the ACA Spirit Award coin. Class 14026T, A1C Lanza graduated 17 Jun 14 and is headed to Davis Monthan AFB, AZ. The AMMO Schoolhouse Top Graduate Award was presented to Airman First Class Nesler for Outstanding achievement in the Munitions Apprentice Course, Sheppard AFB, Texas, 17 June 14. On behalf of the ACA, the Munitions Training Flight Chief, further recognized A1C Nesler’s superior accomplishments with the presentation of the AMMO Chiefs Top Graduate Award along with the ACA Spirit Award coin. Class 14026S, A1C Nesler graduated 17 Jun 14 and is headed to Shaw AFB, SC. The AMMO Schoolhouse Top Graduate Award was presented to Airman First Class Horlback for Outstanding achievement in the Munitions Apprentice Course, Sheppard AFB, Texas, 21 May 14. On behalf of the ACA, the Munitions Training Flight Chief, further recognized A1C Horlback’s superior accomplishments with the presentation of the AMMO Chiefs Top Graduate Award along with the ACA Spirit Award coin. Class 14023S, A1C Horlback, graduated 21 May 14 and is headed to Seymour Johnson, SC. In addition to the Top Grad honor, A1C Horlback was an AMMO ACE Award Winner. He scored 100 % on all course exams! The AMMO Schoolhouse Top Graduate Award was presented to Airman Basic Stroud for Outstanding achievement in the Munitions Apprentice Course, Sheppard AFB, Texas, 21 May 14. On behalf of the ACA, the Munitions Training Flight Chief, further recognized AB Stroud’s superior accomplishments with the presentation of the AMMO Chiefs Top Graduate Award along with the ACA Spirit Award coin. Class 14022T, AB Stroud, graduated 18 May 14 and is headed to Kadena AB, Japan. 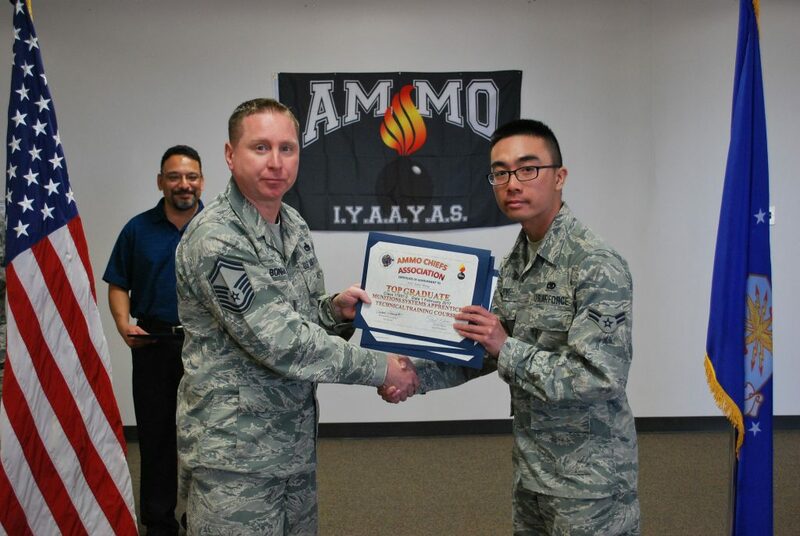 The AMMO Schoolhouse Top Graduate Award was presented to Airman Basic Custodio for Outstanding achievement in the Munitions Apprentice Course, Sheppard AFB, Texas, 18 May 14. On behalf of the ACA, the Munitions Training Flight Chief, further recognized AB Custodio’s superior accomplishments with the presentation of the AMMO Chiefs Top Graduate Award along with the ACA Spirit Award coin. 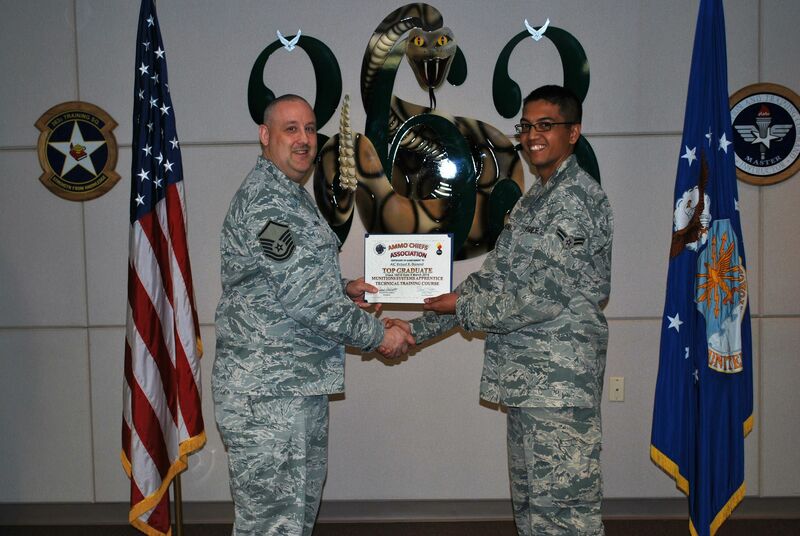 Class 14022S, AB Custodio, graduated 18 May 14 and is headed to Kadena AB, Japan. The AMMO Schoolhouse Top Graduate Award was presented to Airman First Class Weiss for Outstanding achievement in the Munitions Apprentice Course, Sheppard AFB, Texas, 11 May 14. On behalf of the ACA, the Munitions Training Flight Chief, further recognized A1C Weiss’s superior accomplishments with the presentation of the AMMO Chiefs Top Graduate Award along with the ACA Spirit Award coin. Class 14021T, A1C Weiss, graduated 11 May 14 and is headed to Osan AB, Korea. 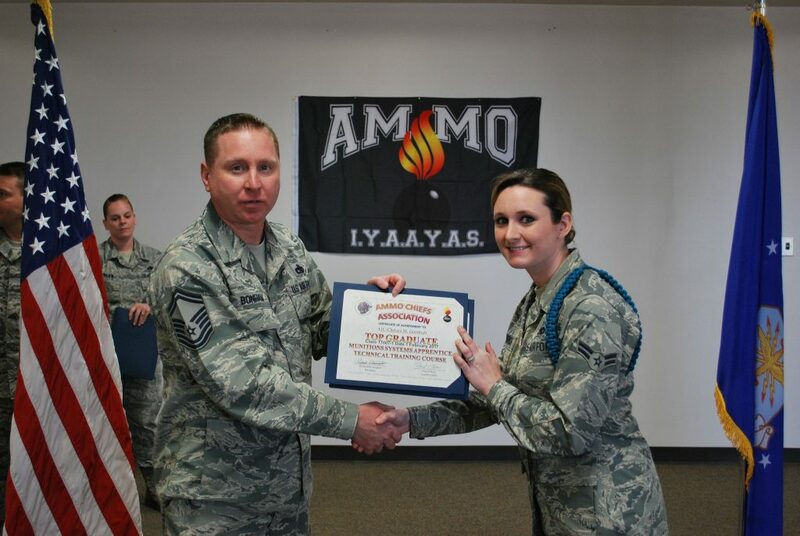 The AMMO Schoolhouse Top Graduate Award was presented to Staff Sergeant Trumbull for Outstanding achievement in the Munitions Apprentice Course, Sheppard AFB, Texas, 4 May 14. On behalf of the ACA, the Munitions Training Flight Chief, further recognized SSgt Trumbull’s superior accomplishments with the presentation of the AMMO Chiefs Top Graduate Award along with the ACA Spirit Award coin. 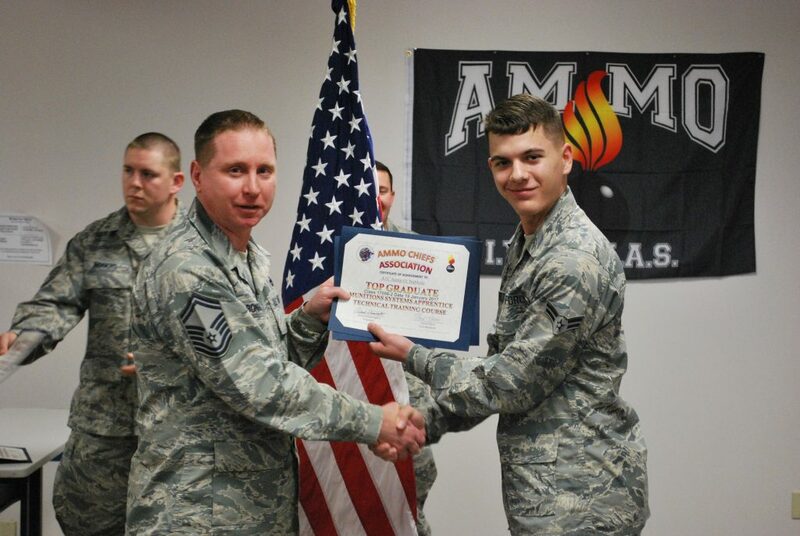 The AMMO Schoolhouse Top Graduate Award was presented to Airman First Class Zmolekfor Outstanding achievement in the Munitions Apprentice Course, Sheppard AFB, Texas, 28 April 14. On behalf of the ACA, the Munitions Training Flight Chief, further recognized A1C Zmolek’s superior accomplishments with the presentation of the AMMO Chiefs Top Graduate Award along with the ACA Spirit Award coin. 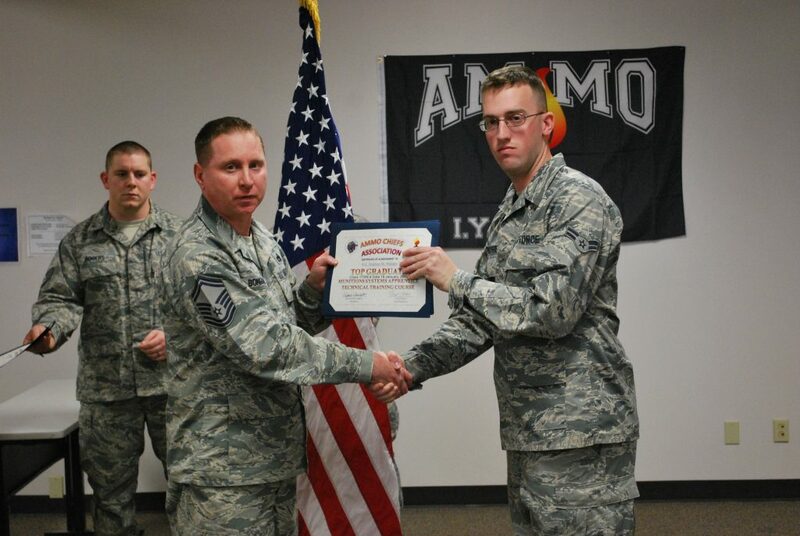 Class 14019T, A1C Zmolek, graduated 28 Apr 14 and is headed to 28th BW, Ellsworth AFB, SD. 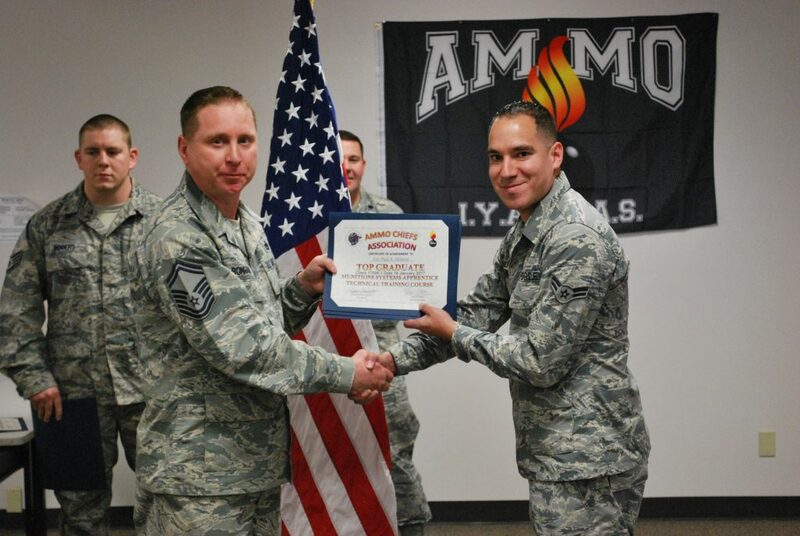 The AMMO Schoolhouse Top Graduate Award was presented to Airman First Class Giron for Outstanding achievement in the Munitions Apprentice Course, Sheppard AFB, Texas, 28 April 14. On behalf of the ACA, the Munitions Training Flight Chief, further recognized A1C Giron’s superior accomplishments with the presentation of the AMMO Chiefs Top Graduate Award along with the ACA Spirit Award coin. 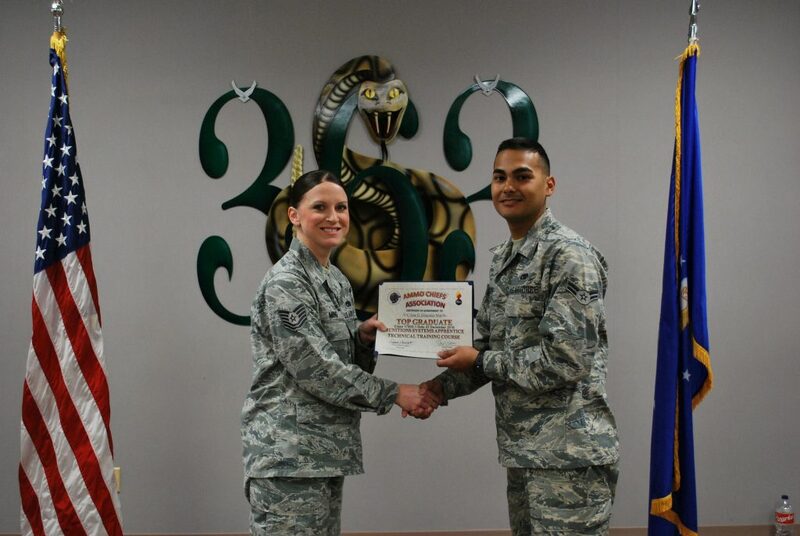 Class 14019S, A1C Giron, graduated 28 Apr 14 and is headed to 28th BW, Ellsworth AFB, SD. The AMMO Schoolhouse Top Graduate Award was presented to Airman First Class Fulton for Outstanding achievement in the Munitions Apprentice Course, Sheppard AFB, Texas, 14 April 14. On behalf of the ACA, the Munitions Training Flight Chief, further recognized A1C Fulton’s superior accomplishments with the presentation of the AMMO Chiefs Top Graduate Award along with the ACA Spirit Award coin. Class 14017S, A1C Fulton, graduated 10 Apr 14 and is headed to Lakenheath RAF. 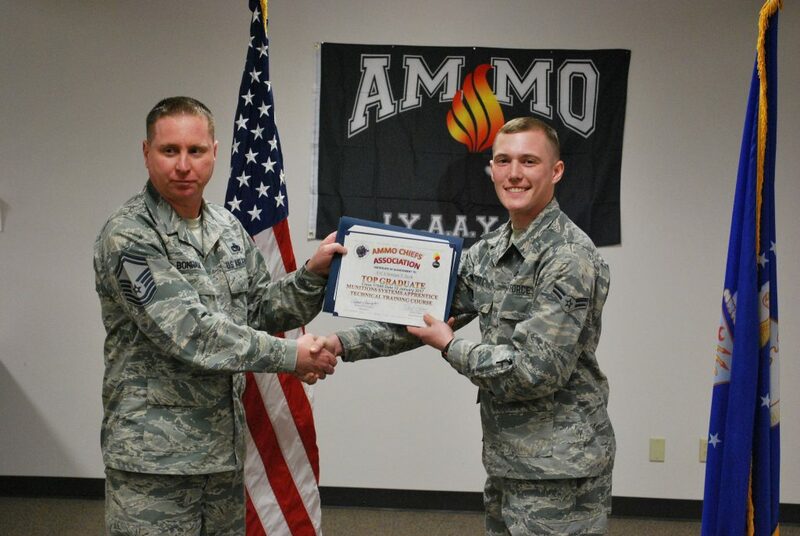 The AMMO Schoolhouse Top Graduate Award was presented to Senior Airman Christian M. Hand for Outstanding achievement in the Munitions Apprentice Course, Sheppard AFB, Texas, 7 March 2013. On behalf of the ACA, the Munitions Training Flight Chief, Mr. Byrd, further recognized SRA Hand’s superior accomplishments with the presentation of the AMMO Chiefs Top Graduate Award along with the ACA Spirit Award coin. SRA Christian Hand is from Colorado Springs, Co and graduated with top honors from the Munitions training school house. He is assigned with the AF Reserves at Peterson AFB, CO. The AMMO Schoolhouse Top Graduate Award was presented to Airman First Class Anthony W. McGee for Outstanding achievement in the Munitions Apprentice Course, Sheppard AFB, Texas, 13 March 2013. On behalf of the ACA, the AMMO Course Chief, MSgt. Keefner, further recognized A1C McGee’s superior accomplishments with the presentation of the AMMO Chiefs Top Graduate Award along with the ACA Spirit Award coin. A1C McGee is from Sipoke Falls, Florida and graduated with top honors from the Munitions training school house. His first tour of duty will be at Ellsworth AFB, South Dakota. The AMMO Schoolhouse Top Graduate Award was presented to Airman First Class Samuel K Fulton for Outstanding achievement in the Munitions Apprentice Course, Sheppard AFB, Texas, 14 February 2013. On behalf of the ACA, the Munitions Training Flight Chief, Mr. Byrd, further recognized A1C Fulton’s superior accomplishments with the presentation of the AMMO Chiefs Top Graduate Award along with the ACA Spirit Award coin. A1C Fulton is from Maui, Hawaii and graduated with top honors from the Munitions training school house. His first assignment is with the 1st EMS, Langley, VA. The AMMO Schoolhouse Top Graduate Award was presented to Airman First Class Brent Maddox for Outstanding achievement in the Munitions Apprentice Course, Sheppard AFB, Texas, 21 February 2013. On behalf of the ACA, the Munitions Training Flight Chief, Mr. Byrd, further recognized A1C Maddox’s superior accomplishments with the presentation of the AMMO Chiefs Top Graduate Award along with the ACA Spirit Award coin. A1C Maddox is proudly serving with the Indiana ANG. The AMMO Schoolhouse Top Graduate Award was presented to Airman First Class Logan Z. Crittenden for Outstanding achievement in the Munitions Apprentice Course, Sheppard AFB, Texas, 10 January 2013. On behalf of the ACA, the Munitions Training Flight Chief, Mr. Byrd, further recognized A1C Crittenden’s superior accomplishments with the presentation of the AMMO Chiefs Top Graduate Award along with the ACA Spirit Award coin. A1C Crittenden is from Maryville, TN and graduated with top honors from the Munitions training school house. His first assignment is with the 18th Munitions Squadron, Kadena AB, Okinawa, Japan. The AMMO Schoolhouse Distinguished Graduate Award was presented to Airman First Class Jason Ervin for Outstanding achievement in the Munitions Apprentice Course, Sheppard AFB, Texas, 11 October 2012. A1C Ervin is from Edmond, Oklahoma and graduated with top honors from the Munitions training school house. His first assignment is with the 325th Maintenance Squadron, Tyndall AFB, Florida. 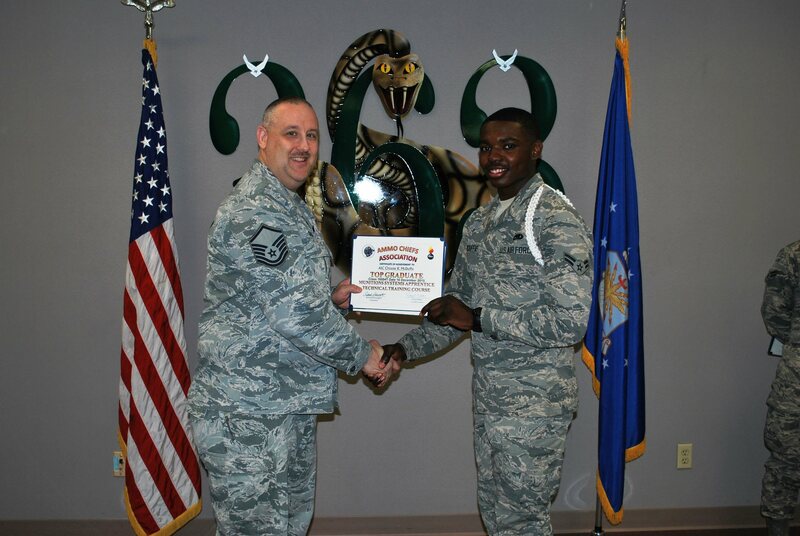 A1C Ervin was extremely thankful and appreciative for the recognition. 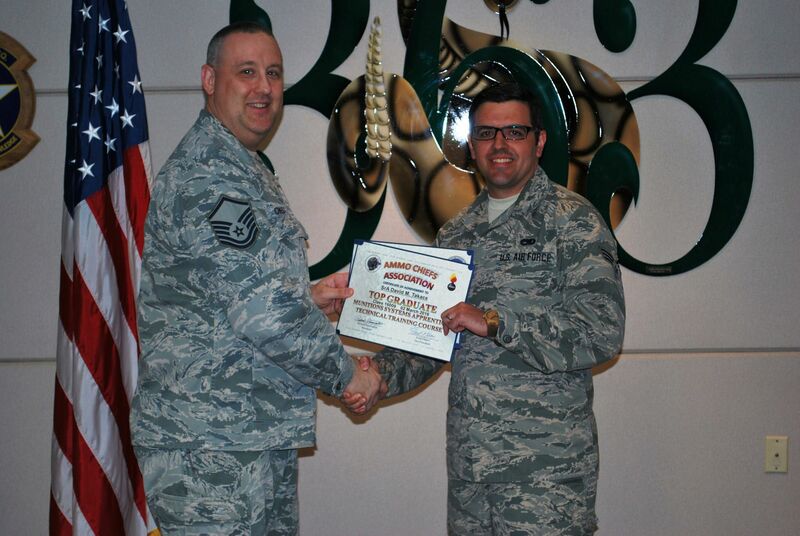 Graduate of the Munitions Apprentice Course here at Sheppard AFB. National Guardsman with the 140th Fighter Wing. He graduated from the Munitions School house at Sheppard AFB, TX on 12 September 2012. 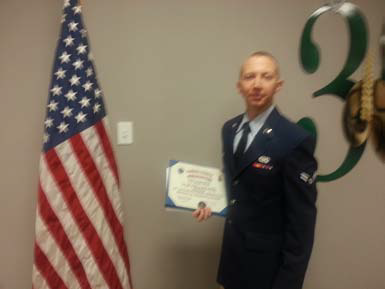 SSgt Condreay was extremely thankful and appreciative for the recognition.